Bilby is doing the moonwalk, Wombat leads the conga, Kangaroo is thumping the drum beat, and no-one twirls quite like Emu! 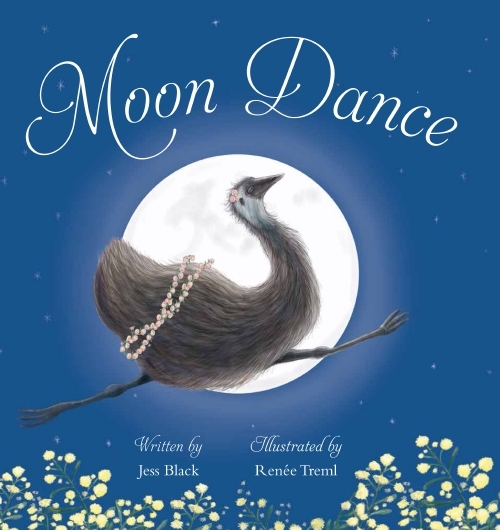 Jump up and join the animals’ moon dance — you’ll soon get in the groove! I was born in Johannesburg, South Africa. I have been living in Newcastle, NSW for the last eight years. Everywhere! School in Cape Town, Hobart, Melbourne and Brisbane. University in Wellington and Cape Town. Not at school but later I was called Kit Kat. Shy, diligent, I worked hard and wanted to please my teachers. I sound like such a nerd! I had a few really good friends. I have always been better with one or two people than in big groups. The worst thing I have ever done is when I was fifteen (and a rotten sulky teenager) I wouldn’t sit next to my parents when they took me to a movie. I still feel deep shame about this. There are too many to choose only one. I loved The Famous Five, Secret Seven and the Magic Faraway Tree series. Later I loved the Earthsea Trilogy. I think R.A. Spratt is very talented. No one person inspired me to write. My kids do provide good fodder. Chris Kunz my editor has been a huge support. My boss Roland Fishman from The Writers Studio taught me to believe in my work. My husband Fergus has read everything I have written in all draft stages and is a huge support. I couldn’t do without his help. I took a gazillion writing courses over a ten year period, then took the plunge after leaving full time work to have a baby. I first wrote in children’s theatre and then children’s television before becoming an author. I worked in Children’s theatre from age 20 and then TV from age 27, books came later at 35. I find that I express myself well when I write. It comes much more naturally to me than to speak. I love exciting stories and I love escaping from reality. If you begin to write and get one idea down then it starts the process and more ideas will build from that. Inspiration doesn’t strike first. You have to do the writing to get more inspiration. Ideas can come at the oddest times in the most unusual places. I get to travel to all kinds of amazing places in my imagination and carry around all of these wonderful characters who are like family to me. Kids always ask me how old I am and it embarrasses the teachers for some reason, but I don’t care. I’m always asked by kids if I know Jack Black. They find this hilarious. I teach creative writing to adults, I go into schools and chat to kids about writing, I read lots of books, see movies, go running, play with my family. I would still be involved in creativity in some form. It’s hard to imagine what else I would do. I love being a writer and everything that goes with it.